Whether they’re rallying around immigration, the environment or something more niche, like smokers’ rights or a desire to abolish Microsoft PowerPoint, single-issue political parties generally struggle to attract a significant number of voters. But at least one narrowly focused party has been picking up steam over the past few months: the Women’s Equality Party, founded in London this past March, has already launched 61 branches across the United Kingdom. Journalist Catherine Mayer, the author of a new biography of Prince Charles and, until recently, a foreign correspondent for Time, came up with the idea after being disappointed by a conference she attended on women in politics. 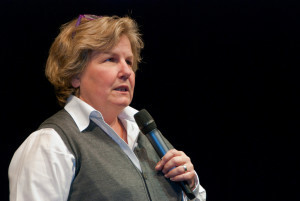 Mayer recruited popular radio host Sandi Toksvig to help get the party off the ground; in June, Toksvig left her job at the BBC to focus on politics full-time. The party’s goals include equal pay, an end to violence against women, and gender parity in the fields of politics, business and education. The exact size of the party isn’t known, but Mayer told Politico their membership numbers “in the thousands.” (The party has over 35,000 fans on Facebook.) Many feminist political parties have cropped up and sputtered out over the past century or so — in the US, the National Women’s Party lasted from 1916 to 1997; Emmeline Pankhurst’s Women’s Party in the UK lasted just two years, from 1917 to 1919 — but there’s a new generation of feminist parties that might just stick around, even if they’re not winning many national elections. Party leader Gudrun Schyman, Feminist Initiative, holding squares meeting at Sergel’s Square in Stockholm for the European elections in May 2014. 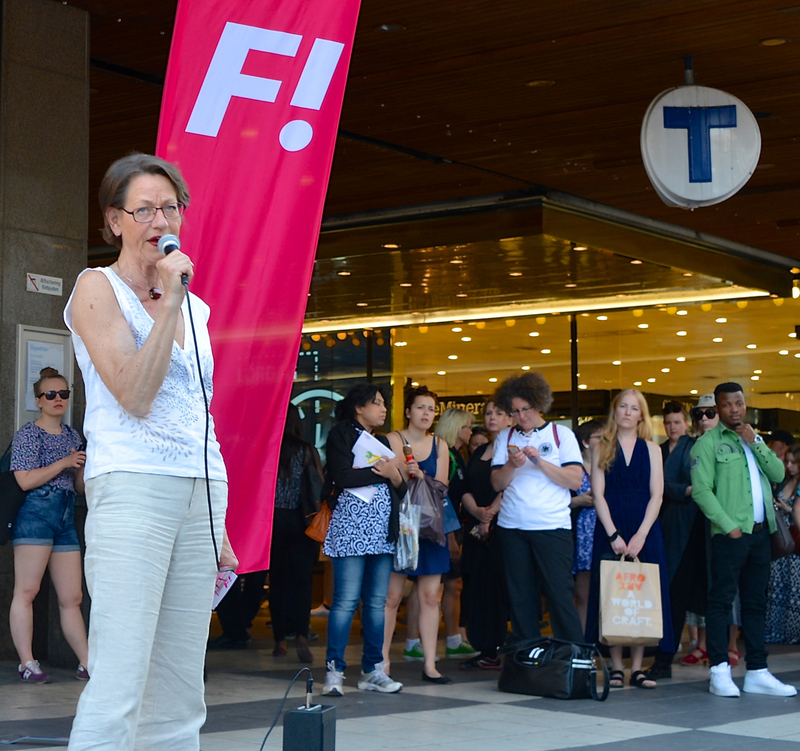 Founded in Sweden in 2005, the Feminist Initiative spread to Norway this spring. Under the slogan, “Replace racists with feminists!” the Scandinavian women’s party has been making a real impact in elections. Last year, their candidate Soraya Posted was elected as a Member of the European Parliament with 5.3 percent of the vote; this year, they’re fielding candidates for local elections in Oslo and Bergen. Their charismatic 27-year-old leader in Oslo, Cathrine Linn Kristiansen, has been helping the party grab headlines in advance of local elections this fall. Not quite a single-issue party, the Peace and Freedom Party (PFP) has been representing feminism, as well as socialism and ecology, since 1967. At various points in its history, the PFP has enjoyed moments of near-mainstream influence; In 1968, capitalizing on Americans’ opposition to the Vietnam War, the PFP registered over 100,000 voters in California and appeared on the state ballot as a third party. In 2008, the party backed Ralph Nader in his presidential bid, and in 2012, they supported the actress Roseanne Barr. (She won more than 48,000 votes, coming in sixth in the general election.) The PFP’s presence remains strongest in California, where they had more than 59,000 registered voters in 2012. Taking its name from the eighteenth-century Filipino revolutionary Gabriela Silang, this party grew out of a march of 10,000 women in 1984. The group currently has a representative in Congress, Liza Maza, who’s helped pass legislation against torture, gender discrimination and violence against women. It’s not just the name of this party that’s cringe-inducing: It’s their whole story. The party’s founder, Mike Buchanan, resigned from his job as a consultant for the Conservatives when Prime Minister David Cameron announced his support for measures that would help more women get into Parliament. Buchanan has self-published books with titles like Feminism: The Ugly Truth and The Glass Ceiling Delusion, and claims to be fighting against feminists’ attempts to “destroy the nuclear family.” Founded in 2013, Justice for Men and Boys first stood for election last year—but it’s gotten more ridicule than serious support. Since its founding in 1998, the Non-Custodial Parents Party—which claims to represent the interest of fathers and non-custodial parents, and is associated with the Men’s Rights movement—has put forth candidates in the Australian elections every year. In the most recent elections, 2013, the party got just 1,547 votes, or 0.01 percent of the vote.